The news of NYC mayor Michael Bloomberg's triumph today over the liberal judge who outlawed his stop-and-frisk program reminds me that Michael Bloomberg is a man you want to have on your side, not on somebody else's side. Moreover, Bloomberg strikes me as a man of fundamentally conservative personality, in the sense of having tendencies toward a natural array of loyalties. In contrast, modern liberals’ defining trait is making a public spectacle of how their loyalties leapfrog over some unworthy folks relatively close to them in favor of other people they barely know (or in the case of profoundly liberal sci-fi movies such as Avatar, other 10-foot-tall blue space creatures they barely know). Bloomberg and, for that matter, Larry Summers strike me as men who by temperament are essentially concentric (and thus conservative) in their loyalties. Of course, this leaves open the question of for whose benefit, precisely, these loyalist urges will be exerted. I favor using carrots of public praise and sticks of public criticism to incline powerful men toward backing the interests of their fellow American citizens over the other interest groups clamoring for their support. Of course, Bloomberg has a lot of options in life about whose side to be on. For example, he is accepting a Russian oligarch-funded "Jewish Nobel Prize" from Bibi Netanyahu. My view is that publicly critiquing powerful individual's loyalties is a natural tool for nudging those power players toward backing the interests of you and yours. It is on the whole a good thing keep a man who controls a "private army" of 44,000 uniformed police officers, a media empire, and whose employees spy on customers of Bloomberg terminals, worried about his reputation. Apparently, however, that kind of criticism of the rich and powerful is just not done anymore. It gets you denounced for mentioning "the dual loyalty slander." My impression, however, is that for anybody who is as much "in the arena" as Michael Bloomberg, restrictions on expressing skepticism about him are pernicious. In general, the more people don't want you to talk about something, the more it needs talking about. But, that kind of moderation is considered these days to be almost unthinkable. A federal appellate court on Thursday granted a stay in the landmark police stop-and-frisk ruling in New York City, and removed the trial judge, Shira A. Scheindlin, from the case. The United States Court of Appeals for the Second Circuit ruled that Judge Scheindlin “ran afoul” of the judiciary’s code of conduct by compromising the “appearance of partiality surrounding this litigation.” The panel criticized how she had steered the lawsuit to her courtroom when it was filed in early 2008. The ruling effectively puts off a battery of changes that Judge Scheindlin, of Federal District Court in Manhattan, had ordered for the Police Department. Those include the operations of the monitor who was given the task to oversee reforms to the Police Department’s stop-and-frisk practices, which Judge Scheindlin found to violate the Fourth and 14th Amendments of the Constitution. In a two-page order, the panel of three judges from the Second Circuit also criticized Judge Scheindlin for granting media interviews and making public statements while the case was pending before her. The judges ordered that the stop-and-frisk lawsuit be reassigned to another judge. My impression of discrimination rulings is that they are full of this kind of bias and partiality, but the liberal judges almost always get away with it. Sometimes they get overturned, but almost never are they publicly humiliated like Judge Scheindlin. I don't know, but one guess might be that these other judges didn't cross crime-fighting billionaire Michael Bloomberg over the core of his legacy as mayor. Charles' 2007 plan is to get rid of the SAT I (the traditional aptitude test) in favor of the SAT II (a.k.a., SAT Subject tests: the less widely required subject achievement tests). The SAT II achievement tests are miniature advanced placement subject tests, but heavily multiple choice and mostly without essay questions. So, moving from the SAT I test, which was originally intended to be more or less of an IQ-like aptitude test to achievement tests might have the advantage that if you are going to spend a thousand hours test-prepping, you might as well test-prep on real subjects like American History and Biology. The University of California used to require three SAT II Achievement tests, but then started demanding expansion of the SAT I to include the demanded writing test. Having gotten its way on the flagship SAT I, the U. of Cal then logically announced plans to pare back the SAT II. But this simplification of the application process would likely hurt Asian high schoolers because their parents are more likely than other students' parents to get them signed up in time to take all these superfluous tests. Figuring out the various ideal points in your child's high school career at which he or she should take each of the three SAT Subject tests is the kind of complicated strategizing that Asian parents are most likely to obsess over. The California Asian Pacific Islander Legislative Caucus (who seem, significantly, to be all Democratic state legislators—the Asian Pacific Islander Legislative Caucus is part of the California Democrats website) wrote an angry letter to the chairman of the UC Board of Regents denouncing the reforms. So, switching from the SAT I to your choice of the SAT II Subject tests is not going to lessen test-prepping. Tiger Moms love the SAT IIs. Something that nobody ever talks about but could make a lot of sense is trying to get the SAT I back to its original intention of being a Scholastic Aptitude Test: i.e., more like an IQ test. Over the decades the SAT I has been repeatedly diluted in the name of "fairness," which, ironically, just plays into the hands of the Tiger Mothers. For example, each year the College Board now releases the list of the 2,000 words from which vocabulary questions will be drawn. One way to find the IQ subtests that are hardest to prep is to look at James Flynn's list of the Wechsler subtests that have had the smallest Flynn Effect. Raw scores on Information (e.g., What continent is Argentina on? ), Vocabulary, and Arithmetic subtests have barely bumped up over the decades, while raw scores on tasks more like programming your VCR have skyrocketed. Indeed, when I look at what I'm still good at as a middle-aged man relative to the young guns who have enjoyed decades more of the Flynn Effect, Information, Vocabulary, and Arithmetic stand out (along with Comprehension, which is next in least Flynn Effect). Since what every pundit who expresses an opinion on the SAT really wants is for the rest of humanity to Be More Like Me, I think we should make the SAT a tool for producing millions of Steve Sailers. Granted, every single electronic device in America would soon be flashing "12:00," but that's a small price to pay for everybody to possess a more nuanced view of historical trends in golf course architecture. Granted, the the IQ subtests that have the least Flynn Effect are among the most culture-loaded. But, life is pretty culture-loaded, too. CONCORD, N.C. — Macy Causey tested Concord Speedway’s quarter-mile track for the first time, flooring the gas pedal in her black-and-pink 30-horsepower racecar and reaching 60 miles per hour on the straightaways. Minutes later, 8-year-old Macy pulled off the track. Her parents, Rette and Dee Causey, opened the hatch, and Macy’s small, gloved hands grabbed the upper bars of the cage as if the car were a jungle gym. She pulled herself into her father’s arms. “Great job, honey,” he said. Macy’s racecar, a used Bandolero that cost $3,000, was a gift from her parents for her birthday last November, and her father taught her to drive it. The 550-pound Bandolero — 34 inches high and 47 inches wide with a 70-inch wheelbase — can reach 75 m.p.h. But speed is restricted on the short tracks where the 8- to 15-year-olds race them. Many children begin go-karting as early as age 3. 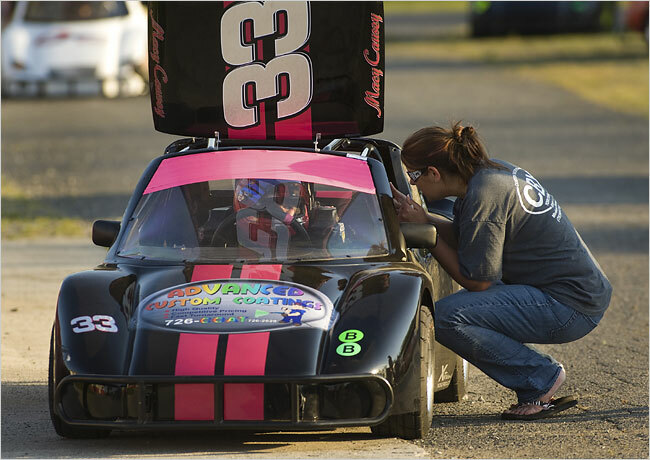 Macy, a second grader in Seaford, Va., is starting with Bandolero racing, a series created in 1997 by the sanctioning body INEX (short for inexpensive) for entry-level cars. Drivers need only be 8; they do not have to pass any safety tests or meet any other requirements. But racing involves other expenses. Almost everyone has a hauler; the Causeys’ cost about $300,000. Their rig is like a studio apartment, with a leather couch, a recliner, a flat-screen satellite television, a kitchen, a dining table and a bathroom with an enclosed shower. Macy's team consists of her parents and her crew chief, Chris Conley, who works on the cars in their garage. David Coleman is redesigning the SAT. Does he know what he's doing? In 1994, Richard Herrnstein and Charles Murray pointed out that the SAT was such an effective college admission test that it was having profound effects on society as a whole (with Herrnstein more positive than Murray about the net impact). Ever since, the College Board (the sponsor of the SAT -- the Educational Testing Service writes it up for the CB) has been trying to do something about that. For example, one problem with the SAT back in 1994 was that it was too easy to get an 800 on the Math part of the test. When I was at Rice U., it was common to hear the better STEM majors say things like, "Well, sure I got an 800 on the Math SAT, but I'm not a real 800 like Joe or Bill are." In contrast, back then the SAT verbal test (on which only double digits scored 800 annually) was, as Henry Harpending has pointed out, perhaps the best high end IQ test in the world. So, in 1995, the College Board changed the scoring. But not to make the Math scoring more like the Verbal, but vice-versa. In the early 21st Century, the chancellor of the College Board's biggest customer, the University of California, demanded changes in the SAT. So the analogies questions were thrown out because they were like, well, you know, they were kind of like ... well, I don't know what they were like, but they were annoying. And a Writing section was added, featuring a large essay which has proven over the last decade to be a probing test of how legible and swift is one's penmanship (or pencilmanship, in this case), although perhaps not much else. The old head of the College Board, former West Virginia governor Gaston Caperton, resigned last year around the time of his third divorce to pursue his fortune on Wall Street. The new head is David Coleman, who is also the author of the Common Core standards for K-12. He soon announced he was going to revamp the SAT by 2015. In other words, the educational establishment has decided to bet the country, at least the K-16 part, on one guy. Coleman sounds like not the worst choice for The Guy. Ideologically, I see a lot of similarity between Coleman and E.D. Hirsch, of the Core Knowledge Foundation. Hirsch was a top academic literary critic who got involved in trying to help local schoolchildren learn. He decided that the reason average children's reading comprehension was so bad was because they didn't know anything -- they were constantly stumbling upon the text's references to events or concepts that they didn't know anything about, and were thus losing the thread of what the author was saying. So, Hirsch argued that schools should teach less poetry and fiction and instead use more informative nonfiction texts that would help students build up their core of common knowledge. Hirsch published long lists of the facts that he felt came up the most often as the assumed background knowledge of the reader in the better sort of writing. This is not a bad idea, although it's not as much of a panacea as Hirsch thought it was. Perhaps because of all the vitriol spewed at Hirsch's Core Knowledge campaign, there have been many denials that Coleman's Common Core has the slightest to do with Hirsch. But, my impression is that they are pretty similar: coming out of the right of center side of the liberal Jewish mainstream. Coleman's philosophy basically appears to be the same as every other educational reformer: Be Like Me. Coleman is a bright, cultured former McKinsey consultant, and thus his Common Core write-up would be a good outline for the home schooling of David Coleman Jr. Unfortunately, I haven't seen much evidence that he knows much at all about, say, psychometrics. TORONTO -- David Coleman, president of the College Board, was fairly general here Thursday in describing the changes coming to the SAT. His theme was that the new SAT would be more closely tied to high school and college curriculums and less coachable than is the current version. I've long argued that the rise in test prepping should lead to more weight in college admissions being given to Advanced Placement test because if you are going to test prep for years, you might as well learn something, like chemistry or French literature. So, maybe this is brilliant ju-jitsu on Coleman's part by applying my AP idea to the SAT. Or maybe he just doesn't get it. The point of having standardized college admission tests is to fill in the obvious shortcoming of just using high school GPA. Making the SAT more like high school seems pointless. If we are all supposed to be into "critical thinking," maybe we should make high school more like the old SAT? Coleman presumably thinks his Common Core is going to revolutionize American K-12 school by making it much more rigorous, so, assuming that will happen real soon now, well, then of course we should change the SAT in 2015 to be more like his Common Core. More likely, the Common Core will just be another K-12 fad, like the Small Learning Communities boondoggle that Bill Gates wasted $2 b-b-b-billion on in the 2000s, but Coleman will manage to do some genuine damage to the SAT. Coleman asked attendees to imagine replacing the current essay (in which students respond to a prompt) with a writing assignment in which students analyze information. "What if you were analyzing a source" in a short essay "and using evidence from that source?" he asked. Might such an essay prompt "celebrate analytic writing?" On the AP history tests, they have data-based essay questions where they give you eight or ten brief documents to use in answering a question. Extending that to the SAT isn't the worst idea. Of course, that's pretty much how the Fire Department of New York hiring test worked: they gave you a few paragraphs of fire fighting instructional material -- e.g., what kind of chain saw blades to use on steel doors and which kind on wooden doors so you wouldn't accidentally rip your face off when the chainsaw bucked -- then asked questions based on the presented material. Test-takers could do well either through good reading comprehension while taking the test or by learning the firefighting material beforehand. As a potential fire victim, that seems pretty okay to me, but the whole test was junked by a federal judge in 2009 because blacks and Hispanics didn't score as well on it. But, AP essay questions are about the AP subjects such as European History, while the SAT is supposed to be a more general test. One of its functions is to find the "diamonds in the rough" who haven't necessarily had every educational advantage. The essential problem with essay questions are small sample sizes, on multiple dimensions, which leads to scores being less reliable. In other words, the endlessly denounced multiple choice question has some advantages, such as that you can ask a lot of them, thus giving a reasonable sample size. He said that he was bothered by the status quo, where the essay "does not grade you on the correctness of what you write." And he described feeling somewhat ashamed when he spoke to a friend who taught SAT test-prep in Hong Kong when she told him how she helped students who asked about how to come up with examples to back up their points in their essays on the SAT. "You make them up," she said. In the decade since the College Board announced and then started giving the essay portion of the SAT, reaction has been decidedly mixed. College Board officials predicted that the addition of the writing test would send a message to high schools to take writing seriously. But almost from the start, many writing experts questioned the kind of writing the College Board was promoting, saying that it emphasized using a few impressive words and paying little attention to facts or logic. A writing professor at the Massachusetts Institute of Technology famously coached students on how to write laughably untrue statements in SAT essays that would receive good grades from the College Board. Many colleges have pointedly not used the writing scores of the SAT. Until Coleman became president of the College Board last year, however, officials there have defended the essay. Coleman didn't focus on the issue in his prepared remarks, but did so when urged by Jon Reider of San Francisco University High School to "get rid of the essay." Reider said that the essay test has forced counselors like him to tell students to do things that are educationally unsound -- just so they can get a decent score on the essay. He said that when smart students who are good writers talk to him about disappointing scores on the SAT writing test, he tells them that they are doing poorly because "you are a good English student and you've been taught to stop and think before you write, but that's not an asset on this test." Sheer amount of verbiage emitted into the test booklet correlates with essay scores. ... It's also wrong, Reider said, for the College Board to promote writing without any relationship to facts. "I challenge anyone in the room: Have you ever sat down for professional purposes to write about a question you have never seen before, in which the accuracy of what you write is totally and utterly meaningless?" Coleman's response to Reider was that "you've got a real point. You really do." But Coleman cautioned that eliminating the essay, instead of fixing it, might send the wrong "message." Fixing essay grading sounds extremely expensive. Are they really going to pay graders to stop grading and go look things up on Wikipedia to see if the student knows what he's talking about? He did not dispute any of Reider's criticism, but said that "there may be alternatives beyond dropping it." Coleman first announced plans to redesign the SAT in February. Most of his comments here were consistent with the goals he announced previously for the shift -- that he wants to more closely align the SAT with the high school curriculum, for example. The SAT college admission test was long dominant over its Iowa competitor, the ACT, but recently the ACT has surpassed the SAT in sheer numbers. The ACT positions itself (I don't know how accurately) as the meat and potatoes test that's an achievement test of what you learned in high school, not some fancy-pantsy "aptitude" test. On Thursday, he took swipes at how the SAT has evolved, noting that the test has created a huge test-prep industry and that students aren't necessarily being encouraged to focus on important learning. He noted that when someone says a person has just used "an SAT word," the idea isn't that the person has shown eloquence or clarity but that "they have used a word they would never use again." Coleman also talked about how a better SAT shouldn't be something one has to learn at a test-prep service. The revised SAT "shouldn't be a sudden departure" from what students learn in class, he said. A student's plan to take the SAT "should inspire excellence in the classroom." One questioner (and a number of people in comments after the presentation) suggested that Coleman was describing a test more like the ACT, which has long claimed that it is more curricularly based than the SAT. And the ACT has gained substantially against the SAT in recent years in market share. Amid all these discussions, one questioner here, warning the audience to prepare to be shocked, said that he liked the current SAT, and feared the new SAT might be something like New Coke. Coleman responded that "I'm not interested in a Coke/Pepsi kind of debate here." You may not find the New Coke fiasco of 1985 interesting, Mr. Coleman, but fiascos are interested in finding you. And he asserted that what he was talking about was a new kind of test, one that would promote educational values. Presumably, there are some good psychometricians in the backrooms at ETS whose jobs are mostly to keep the politicans running the College Board from messing up too badly. Another question -- from someone who used to work in admissions at an elite university -- highlighted how challenging that may be. The questioner said that his instructions at the university -- straight from the president's office -- were to increase average SAT scores and to increase minority enrollments. He said that he found it impossible to do both. This article is wrong. It's misguided in its premise and fallacious in its reasoning. Oh where to begin. At the core there's the lament from the progressive cognoscenti that the SAT/ACT is unfair and unnecessary. The later assertion is demonstrably untrue. Rampant grade inflation and the unevenness in the quality of public and private schools makes GPA's at best an imprecise indicator of a student's scholasticism. To the former 'unfair' quality of these tests -I say yes. Of course, no test can can measure a student's heart, his resourcefulness in the face of terrible adversity, his ability to carry the day by inspiring others. In other words, test’s are imperfect. As Churchill opined, “Democracy is the worst form of government, except for all those other forms that have been tried from time to time.” The same can be said for these standardized tests. to MIT students who make up plausible-sounding hoax versions of American history to use in essays. demonstrates my point in that anyone who can spin such a well written alternate US history thesis is demonstrating greater skill than any bare recitation of the actual facts. Kids, don't try making up alternate versions of American history if you're not an MIT prankster. What rankles me is when Coleman says this, “He noted that when someone says a person has just used "an SAT word," the idea isn't that the person has shown eloquence or clarity but that "they have used a word they would never use again." The false assumptions there are many. The SAT has moved away from vocabulary in the last 25 years, and it has been wrong to do so. Through the years, educators have been left disconsolate over the sight of students sitting in test prep classes or in lonely school hallways trying to force feed themselves a diet of 2,000 vocabulary words. These folk lamented that students weren’t ‘learning’ anything, and therefore this test was bad. This mode of thinking is emblematic of the failure of much of our educational system today. Educators with soft hearts are under the mistaken belief that everything can be taught in a fun and engaging manner. This is pie in the sky thinking that points to people like Jamie Escalante (the famous L.A. teacher that was chronicled in the film Stand and Deliver) as a teacher who can make even the most erudite subjects accessible. The failure there is confusing the outlier with the majority. The brilliance and exceptionalism Escalante demonstrates is the very reason we make movies of these individuals. We don’t make movies of the thousands upon thousand of mediocre teachers, nor do we exalt those sports participants who are just okay. Yet, the education establishment posits much of its curriculum around just such teachers. Analogously, designing and teaching a high school basketball team under the notion that they are all fledgling Michael Jordans could only lead to disastrous results. Learning words is hard. For most students it’s tedious. There is no magic, no epiphanies to be had where like Dorothy’s yellow brick road the whole journey is clear and stretches out plainly for the student to see. The same could be said for memorizing times tables, the Periodic table, the capitols of the States and so on. The point is that life is full of these moments and the sooner you learn this the sooner you can stop fretting over the supposed inequity and get the job done and hopefully move on to something more fulfilling. Second, Coleman’s assertion that SAT words will never be used again is truly abhorrent. See there’s one right there. Forbes did a survey of major companies that asked what they looked for in new hires, and other than what college they attended, being articulate was deemed essential for success. Coleman’s attempt to dumb down the SAT or any test by removing this element follows the specious assumption that testprep is somehow undemocratic, elitist, unfair to the majority. In the area of vocabulary he couldn’t be more wrong. For no cost a student can jump on the internet and download the 2,000 or so tough words that may be on the test. Where’s the elitism there? Maybe the student hasn’t been in the best english program but that’s irrelevant if she’s just willing to work hard at memorization. Hard work, what is more egalitarian than that? 1) Aligning the test more closely with curriculum will make it MORE coach-able, not less. We already have tens of thousands (maybe 100k+) straight A students graduating from high school each year. High school curriculum just isn't that difficult. With hard work and organization (either directly or by parental fiat), you don't need to be particularly bright to get all the answers correct. The purpose of the SAT and ACT, regardless of the political incorrectness of the observation, is to isolate reasoning ability independent of things like hard work and organization skills. What would be the purpose of a test that simply mimics the GPA? How would that be useful to admissions officers? 2) Furthermore, the College Board itself has conducted a fair amount of research on the efficacy of test prep and they have shown that in the aggregate, it just doesn't improve scores very much. So what's with the diatribe against test prep? I think we need a major independent study of the effectiveness of massive test prepping. ... I've got a news flash for Mr. Coleman... the test prep industry will get MUCH bigger, not smaller, if the test becomes more aligned with curriculum! 3) The essay is not a writing test, it's a written reasoning test. Surely it can be improved. But my experience is that essay scores correlate pretty well with the rest of the test, which tells me that in a broad sense it accomplishes its goal. As Robert Gordon has suggested, everything is an IQ test, in the sense that we see positive correlations between almost all tests of anything. Oh the humanity, when will I ever use these words again?? How about, 'just about every day in your adult life'! These are all words that appear regularly in level 4 and 5 difficulty questions. The number of truly obscure words on the SAT is very small. This test does a great job of including words in its difficult questions that most college freshman should know, but don't. To put someone in charge who does not agree with this statement seems utterly bizarre to me. In conclusion, it looks to me that the College Board is shooting itself in the foot. No college admissions officer needs a test score that is simply going to mimic a student's GPA, and that seem to be the direction Mr Coleman is going in. There was a fair amount of national media excitement this weekend over the news that Darrell Wallace, Jr. had won a NASCAR race. I’ve been especially lax about keeping up with NASCAR’s minor-league truck-racing circuit on which the 20-year-old Wallace triumphed Saturday. The news should raise the question: If it takes so much organized effort in the 21st century for a black to win a small-time NASCAR contest, how in the world did Wendell Scott triumph in a Grand National race a half-century ago, back before diversity awareness? As I've mentioned before, relative to the usual quality of educational standards writing, the new Common Core standards reflect a fine masculine intelligence. The author clearly understands how a highly intelligent person -- say, a McKinsey consultant who also has refined taste in the humanities -- thinks, and has methodically laid out what future McKinsey consultants should learn during their K-12 years. Not surprisingly, the Common Core's architect David Coleman (Stuyvesant, Yale, Rhodes Scholar at Oxford, and Cambridge) is a former McKinsey consultant. Of course, nobody involved with the Common Core appears to have thought much about students who are not going to be McKinsey consultants. What happens when they fall behind the rigorous pace Coleman has decreed? But, are there such mythical beasts as average students, much less below-average students? If they exist, Coleman didn't grow up hanging around with many. When he was at Yale, he did some tutoring of underprivileged New Haven kids (where he had the life-altering revelation that none of them were ready for Yale). This extra-curricular activity helped get him his Rhodes Schlarship. As a boy growing up in downtown Manhattan with a college president for a mother and psychiatrist for a father, David Coleman often had lively and lacerating dinner table conversations. 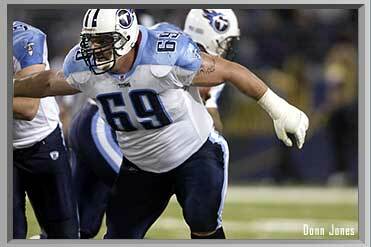 “My parents, while both working, were home every night at dinner,” said Coleman, now 43. The family wasn’t satisfied with easy repartee. If Coleman went to a movie or read a book, his parents wanted to know what he learned from the experience. Coleman often found himself arguing a point before he took the first bite, an eagerness that both charmed and aggravated his parents. As president of the College Board, a national education company, he is redesigning the SAT, the standardized test which high school seniors take for college admission, and he is expanding the Advanced Placement program, which offers college-level classes and tests for high school students. How did Coleman wind up in the middle of the 21st century’s curriculum wars? His path started at his parents’ dinner table, and wended its way through selective New York public school Stuyvesant High, making an important pit stop at his bar mitzvah. Coleman gleaned many lessons from his bar mitzvah, said Jason Zimba, a Common Core co-writer and lifelong friend who taught mathematics at Bennington College, where Coleman’s mother Elizabeth served as president. The experience of conducting a deep exegesis at age 13 framed Coleman’s thinking about education. “The idea that kids can do more than we think they can is one of Judaism’s most beautiful contributions,” he said. Asking 13-year-olds to give a prepared speech in front of people they love is a bold charge, not unlike encouraging disadvantaged kids who don’t see themselves as academically minded to take AP courses. “I wish kids could encounter more stretched opportunities like that in school — all kids,” he said. These ideas, Sherman speculated, stem from Coleman’s religious background. “He grew up in a family that extremely prioritized the value and importance of a deep, broad education,” Sherman said. “Those Jewish values toward education have a lot to do with his belief system: Every child should be a smart thinker, a deep thinker, someone who’s analytical and probing.” Coleman also believes that religious texts have a place in the public school curriculum. Before Coleman and Zimba published their paper, in 2008, the National Governors Association convened a group of governors who wanted to create a set of unified educational standards nationwide. Because states write their own standards and exams, students who move across state lines might find themselves passing math in one state and failing it in another. The governors sought to address this problem by creating common standards. Attracted to Coleman’s idea of “fewer, clearer, higher,” they tapped Student Achievement Partners to write them. “While sometimes I’ve been called an architect of their standards, I think their true architecture is evidence,” Coleman said. “That’s the binding secret of the standards.” Coleman, Zimba and Sue Pimentel, an education consultant, made sure the standards reflect the skills students need to succeed after high school. As the fight over the Core plays out in the states, Coleman now has a broader view on education. Last summer, the College Board announced they would hire Coleman to lead the organization. Since then, he has engaged the organization’s members in creating a redesigned SAT, which will be unveiled in 2015. Miles Kimball is an economics professor at the University of Michigan. He blogs about economics, politics and religion. Noah Smith is an assistant professor of finance at Stony Brook University. His blog is Noahpinion. We hear it all the time. And we’ve had enough. Because we believe that the idea of “math people” is the most self-destructive idea in America today. The truth is, you probably are a math person, and by thinking otherwise, you are possibly hamstringing your own career. Worse, you may be helping to perpetuate a pernicious myth that is harming underprivileged children—the myth of inborn genetic math ability. Is math ability genetic? Sure, to some degree. Terence Tao, UCLA’s famous virtuoso mathematician, publishes dozens of papers in top journals every year, and is sought out by researchers around the world to help with the hardest parts of their theories. Essentially none of us could ever be as good at math as Terence Tao, no matter how hard we tried or how well we were taught. But here’s the thing: We don’t have to! For high school math, inborn talent is just much less important than hard work, preparation, and self-confidence. Sure. No doubt that's part of the story. 1. "the well-prepared kids [who] get perfect scores"
2. "the unprepared kids [who] get only what they could figure out by winging it—maybe 80 or 85%, a solid B"
There are more levels of high school math students in heaven and hell than are dreamt of in your philosophy, Noah. P.S. Robert VerBruggen correlates algebra grades and scores on the ASVAB military entrance exam here. Shoving a fat man under the trolley: abstraction or fiasco? As before, a trolley is hurtling down a track towards five people. You are on a bridge under which it will pass, and you can stop it by dropping a heavy weight in front of it. As it happens, there is a very fat man next to you – your only way to stop the trolley is to push him over the bridge and onto the track, killing him to save five. Should you proceed? I noted that very fat men tend to be hard to push. Normally I object to the learned autism of most contemporary moral philosophy, but in this case the problem is clearly your and many of your commentators' learned retardation. Inability to abstract shouldn't be a point of pride. Here's the beginning of another thought experiment. To explain Newton's Laws, a physicist begins "imagine a frictionless world composed of a single billiard ball sitting motionless on an infinite plane. The ball is set into motion at a constant velocity of 10 m/s . . ." Would you have your nit-picking reaction then (why 10 m/s? Is the ball stripes or solids? I've never seen an infinite plane!)? Of course not, because you and every other 3-digit IQer would understand that it is a simplification intended to show clearly some essential features (in this case, why an object set into motion stays in motion along its vector). This, despite the fact that the frictionless plane is more alien to your experience than any version of the trolley problem. I chose Newton because his example is very influential. Like Newton, many scientists begin with simplified, unrealistic foundations, then try to build atop that more and more complexity until we have a reasonably accurate predictive model. It doesn't always work, but that is the fault of the scientist, not some flaw in reductionism. The Trolley Problem needs to be understood in this light. The Trolley Problem is obviously a simplified situation. You aren't the first person to realize that. Everyone knows it, philosophers and psychologists included. The simplifications are necessary, because even small details can change people's responses dramatically. Wright and Greene talk about this in their bloggingheads talk -- changing the scenario from one where you push the fat man to one where you drop him onto the tracks through a trap door by pulling a lever drives a lot of people into the sacrifice-fatty camp. But, the simplifications are ok because were left with a scenario that has, for most, a strong intuitive tug and that can be easily tweaked get different reactions. That last part is important, because by tweaking we can begin to figure out the (sometimes surprising) things that can affect moral cognition. Moral psychologists are interested in the responses for their own sake, and moral philosophers are interested for exactly the reasons Greene talks about -- if our moral intuition can be tossed hither and tither by something so silly as whether we touch the fat man or use a trap door, should we trust our gut reaction for any moral situation? Maybe we still should, but it's deep question, and one that gives only limited support to utilitarianism. - Plenty of time to think things through logically. - No outside resources available to offer easy win-win solutions. But I like the unintentionally comic Trolley Problem precisely because, when you stop to think about it, it raises what ought to be an important issue in moral philosophy: the "Law of" (or, better, tendency toward) Unintended Consequences. Even within the narrow moral imagination of the utilitarian philosophy, there are good reasons why it's usually a bad idea to decide to try to kill somebody with your bare hands even if it seems like the logical thing to do after one or two seconds of reflection. Having a general emotional prejudice against starting a lethal brawl because it seemed like a good idea at the time may not be as illogical as utilitarians assume. If you try to shove a fat man to his death, will everything ensue exactly as the problem assumes? Very likely not. Instead, you are more likely to wind up with a lot of grappling, grunting, and sweating. Maybe in your struggle, both of you will eventually fall to your deaths, after the trolley has shot past, thus winding up with seven deaths, not five. This helps explain why people tend to be less averse to less messy, more mechanistic -- indeed, more deterministic -- version of the Trolley Problem, like throwing a switch or opening a trapdoor that sacrifices one to save five. Among much else, being mechanical, these methods seem more likely to work than getting into a shoving match with somebody larger than yourself. The messiness of trying to throw a fat man off a bridge shouldn't be conceived of as merely a unique, isolated issue in moral philosophy. It has broader implications for morality in the real world. Say there is an unlovable dictator who, after a long nasty career of attacking other countries, has settled down to more or less minding his own business. Should we invade his country to bring his oppressed people democracy? Those ancestors, 295 of whom have their names on the monument, were slaves who once lived where the campus now stands. What today is a university was once a plantation. What is now a nation was once a colony. In Barbados and throughout the Caribbean, slavery remains a vivid and potent metaphor, and a cultivated memory. Presiding over the event was Sir Hilary Beckles, the head of the university and a prolific historian. He and his Jamaican colleague Verene Shepherd have spurred on the recent call by the 15-member Caribbean Community for Britain, France and the Netherlands to pay an undefined amount of reparations for slavery and the slave trade. The group plans to file suit in national courts; if that fails, it will go to the International Court of Justice. Uniting the Caribbean around any kind of policy is not easy. The region is linguistically and politically fragmented, with links to former colonial powers or the United States often trumping cooperation. But with this new call, the community, known as Caricom, is tapping into one thing that all its member states have in common: the lingering effects of slavery. One irony of history is that, with the exception of Haiti, average per capita incomes of the descendants of slaves in Caribbean countries are well above those in West African countries. Even more ironically, many of today's impoverished West Africans are descended from the people who sold the West Indians' ancestors into slavery. 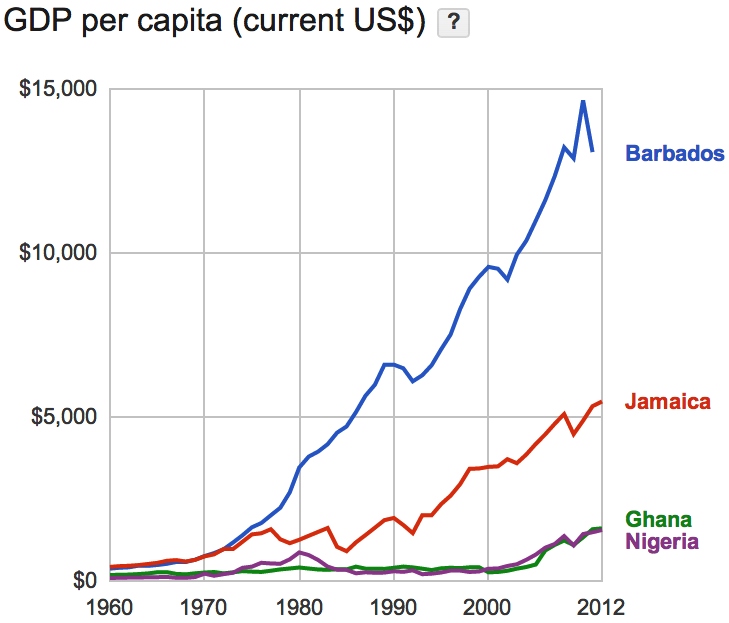 The graph from Google above features two West Indian countries and the two most affluent West African countries (leaving aside two super-corrupt oil countries: Gabon and the nightmarish Equatorial Guinea). Nigeria has oil and corruption, while Ghana only began exporting oil three years ago. I haven't been following the news lately, but Ghana, after a bad start in the 1960s-70s, has usually been said to be the best governed West African country. It looks like its economy was turning up even before the oil started flowing. While not the richest West Indian country (Trinidad, for example, has oil, but also, more impressively, refining; and some very small islands are wealthy tax refuges), Barbados has long been seen as the nicest West Indian country. Jamaica, not so much. 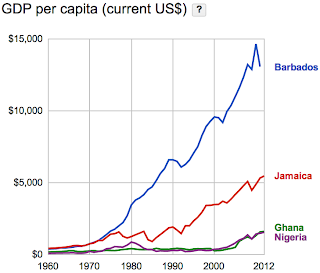 So, the Jamaica to Ghana comparison seems not unreasonable. In 1999, Joshua Greene—then a philosophy graduate student at Princeton, now a psychology professor at Harvard—had a very fertile idea. He took a pretty well-known philosophical thought experiment and infused it with technology in a way that turned it into a very well-known philosophical thought experiment—easily the best-known, most-pondered such mental exercise of our time. In the process, he raised doubts, in inescapably vivid form, about the rationality of human moral judgment. The thought experiment—called the trolley problem—has over the past few years gotten enough attention to be approaching “needs no introduction” status. But it’s not quite there, so: An out-of-control trolley is headed for five people who will surely die unless you pull a lever that diverts it onto a track where it will instead kill one person. Would you—should you—pull the lever? Now rewind the tape and suppose that you could avert the five deaths not by pulling a lever, but by pushing a very large man off a footbridge and onto the track, where his body would slow the train to a halt just in time to save everyone—except, of course, him. Would you do that? And, if you say yes the first time and no the second (as many people do), what’s your rationale? Isn’t it a one-for-five swap either way? Greene’s inspiration was to do brain scans of people while they thought about the trolley problem. The results suggested that people who refused to save five lives by pushing an innocent bystander to his death were swayed by emotional parts of their brains, whereas people who chose the more utilitarian solution—keep as many people alive as possible—showed more activity in parts of the brain associated with logical thought. If you put Greene’s findings in general form—human “reasoning” is sometimes more about gut feeling than about logic—they are part of a wave of behavioral-science research that in recent years has raised doubts about how much trust your brain deserves. The best-seller lists have featured such books as Predictably Irrational, by the Duke psychologist Dan Ariely, and Thinking, Fast and Slow, in which the Princeton psychologist and Nobel laureate Daniel Kahneman covers acres of research into humanity’s logical ineptitude. I've found a pretty interesting Trolley Problem study that I'll get to in the future, but, beforehand ... Isn't the Trolley Problem the dumbest question ever? First, why use something as unlikely to successfully work as a human body, when you should be looking around for something more likely to slow down a trolley? You know, rather than immediately push the fat man to his death, maybe it would make more sense to enlist his help in finding and shoving something more useful into position? Second, assuming the problem comes with some rationalization for its Moloch-like desire for human flesh, why not jump yourself? I mean, I weigh 197 pounds. That's pretty fat (although not as fat as I used to be!). Presumably, the question comes with some explanation for why only somebody fatter than yourself will do the trick? But, how do you know? In what universe do runaway trolleys come with a safety label that reads: "Your 197 pounds is not heavy enough. Only an NFL offensive lineman-sized fat man will do." Third, have you ever tried to push a fat man to his death? I don't want to get into a lot of irrelevant details here of who tried to do what to whom and why it seemed like a good idea at the time, but let me just note for the record: It's not really as easy as philosophers assume. Of all the sizes of human beings, men big enough to stop a runaway trolley are the hardest to push around. The NFL searches them out precisely because the laws of physics mean they are hard to move. So, if you tried to shove a fat man onto the tracks, he'd probably say, "Hey, knock it off." And if you persisted, you'd probably just wind up wrestling in the dirt while the trolley zooms past. So maybe the aversion to pushing fat men to their deaths of most people who aren't utilitarian philosophers makes a little sense? Robots have been back in the news for several years, with many weighty discourses about the future of the economy after the robots have taken over. This always reminds me that back around 1984, the Proctor & Gamble headquarters in Cincinnati had robots delivering the mail. I practically had a heart attack the first time I saw one, when the elevator opened and the robot mail cart inside beeped at me to get out of the way, robot coming through! In an open office area we saw a robot mail cart. It ran on a chemical strip laid into the gray carpet. The mail cart made the rounds of offices and halted at certain spots, not moving on again until someone pressed a strip at the top. If a person got in its way the cart beeped. You can see the problem: the robot cart didn't have hands to lay the mail in the secretary's inbox, so if nobody was there to take the mail off its nonhands, it would eventually have to roll onward. Better to develop email. Why so few great Frenchwomen on the left? As I mentioned below, the Socialist president of France is looking to honor a great Frenchwoman in the government's Panthéon in Paris. The frontrunners are said to be Olympe de Gouges and Germaine Tillion, whose names don't exactly ring bells. A reader points out that my nominee -- Joan of Arc -- wouldn't fly because the Panthéon is the Left's shrine, and St. Joan is a saint. Thus, three obvious giants -- Descartes, Pascal, and Pasteur -- can't be in the Panthéon because they were Catholics. Still, you would think that the French Socialist government would be able to come up with a better list than Gouges and Tillion. After all, in contrast to most cultures around the world, the French have long celebrated the feminine element. Paris (or Versailles) has been the dream destination for women for hundreds of years. The reason the Statue of Liberty is of a woman is because she's French. This shortage of great Frenchwomen on the Left is not a coincidence. The question may have first been raised by Louise Élisabeth Vigée Le Brun (1755-1842), court painter to Marie Antoinette. She is usually considered the greatest female artist of her age, the John Singer Sargent of her time. Vigée Le Brun lived a long life, much of it in exile, and met everybody in Europe. 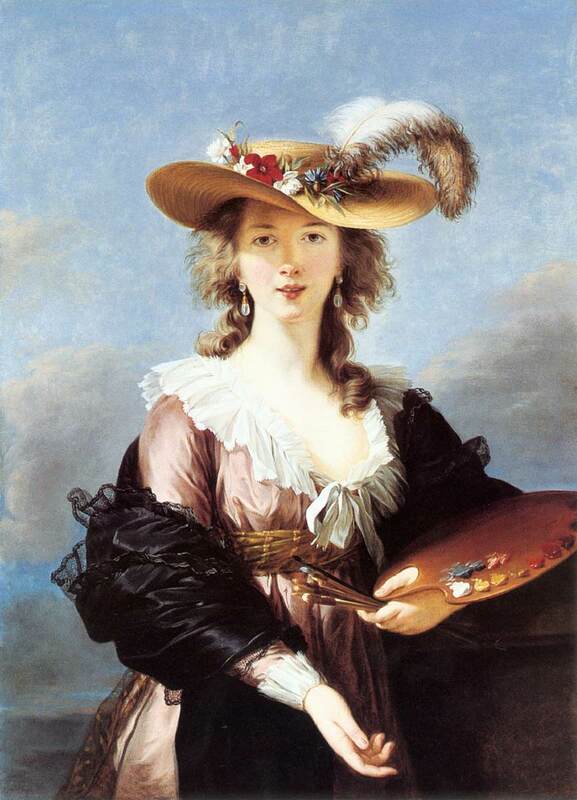 As an ardent royalist, though, Vigée Le Brun is ineligible for Pantheonization. In her memoirs in the 1830s, she pointed out that after the stable, hierarchical 18th Century in which women at the top of society had flourished (think of the great salons that intellectual Frenchwomen had kept in Paris), the Revolution of 1789 had much strengthened the masculinist element within European culture -- politics and war came to the forefront, and women's concerns were depreciated. The new era was one where the dominant impulses were neoclassical rather than rococo, Beethoven rather than Mozart, David rather than Vigée Le Brun. There were precious few girl nerds at the time. There was one who programmed a hit arcade game called Centipede for the first video game company, Atari, and a few others. There were, however, extraordinary female figures who served as the impresarios of social networking before there was an internet. It still seems wrong to name them, because it isn't clear if I would be talking about their private lives or their public contributions: I don't know how to draw a line. These irresistible creatures would sometimes date alpha nerds, but mostly brought the act of socialising into a society where it probably would not have occurred otherwise. A handful of them had an extraordinary, often unpaid degree of influence over what research was done, which companies came to be, who worked at them and what products were developed. That they are usually undescribed in histories of Silicon Valley is just another instance of what a fiction history can be. The advent of social networking software and oceans of digital memories of bits exchanged between people has only shifted the type of fiction we accept, not the degree of infidelity. Anybody know who he's talking about? I'm a complete outsider, so I probably don't know at all. Among public figures, I'd probably guess Esther Dyson (physcist Freeman Dyson's daughter) and Laura Arrillaga-Andreessen (daughter of Silicon Valley land baron John Arrillaga and wife of web browser inventor / venture capitalist Marc Andreessen), but, presumably, some of the women Lanier are referring to are unknown to nobodies like me. Which Frenchwoman most deserves recognition in the Panthéon? Why So Few Women in the Panthéon? HOUSTON — In the politics of national identity, as with the politics of real estate, there are three cardinal rules: location, location, location. Few events better illustrate this truth than the current debate in France over whose earthly remains best belong in the basement of a hulking neo-Classical pile with a fissuring dome and bricked-up windows that looms over Paris — otherwise known as the Panthéon. And is the nation truly grateful? Apart from Voltaire and Rousseau, Hugo and Jean Moulin, most French people could more easily identify the starting five of the Miami Heat than any five of the Panthéon’s remaining residents. The honorees are mostly soldiers and politicians, but it's not that bad a bench: Zola, Braille (I hope people can identify his contribution to human welfare), Lagrange, Condorcet, and Mirabeau. Out of all the French contributors to humanity (which are enormous), it's a pretty paltry list, though. Lately, they've been adding blacks like Toussaint Louverture and mulattos like Dumas the Elder. Over the last few months, an official government Web site inviting citizens to suggest candidates, as well as one run by Osez le féminisme (Dare to Be Feminist), have gathered hundreds of candidates. Two names, Olympe de Gouges and Germaine Tillion, have appeared the most frequently. To choose one man and one woman to join the 71 “great men” — including one great woman — in the Panthéon would be a mockery of parity. Perhaps Mr. Hollande, who strikes many as too prudent and indecisive, will show he is capable of the same heroism and generosity as these two women and name them both? Actually, I can think of a woman of more importance in the history of France than Olympe de Gouges or Germaine Tillion, a teenage girl who had the most important idea in French (and perhaps world) political history. In the midst of the 100 Years War, in which English armies roamed about the French countryside wreaking havoc in their kings' efforts to enforce their complicated genealogical claims to rule, Joan of Arc rejected these medieval notions of dynasticism for nationalism. She went to war for a central idea of the modern world that is the political basis of France's greatness: France should be ruled by the French. So, why won't the Socialist government put up a plaque in the Pantheon in honor of the single most astonishing figure in French (and perhaps human) history? Because the National Front identifies with Joan of Arc, and the Socialists have been trying to arrest the NF's female leader Marine Le Pen, who came in third in the last presidential election. SAN JOSE -- More than 60,000 tech workers can seek monetary damages from Apple (AAPL), Intel (INTC), Google (GOOG) and Adobe Systems (ADBE) because of a federal judge's ruling in a suit claiming that former Apple CEO Steve Jobs conspired with other local executives to limit the workers' pay by barring them from moving from one company to another. In granting class-action status to the suit Thursday, U.S. District Judge Lucy Koh in San Jose cited what she termed "considerable, compelling common proof" that the Silicon Valley companies engaged in antitrust behavior by agreeing not to try to lure away each others' employees. Lou Reed of the Velvet Underground is dead at 71. I have this theory that celebrities like Reed live longer, on average, than you or I would if we did the same things to our bodies. They really are better than us, metabolically speaking. By the way, everybody knows that Science has proven that nobody can change from gay to straight. Except there seem to be various celebrities who have. Reed, for example, always went around saying he was a junkie (here is the Velvet Underground's 1967 epic "Heroin") homosexual. But then when AIDS came along when he was 40, he suddenly was an ex-junkie ex-homosexual. Also, I'd like to point out the virtues of a clattering sound. "The second point to make is that when we hear “early childhood education” we mostly think of pre-K. In fact, the earlier the intervention, the better. Helping pregnant moms avoid substance abuse is highly cost-effective, and then helping them through home visitation programs like Nurse Family Partnership in the first couple of years of life is crucial as well." - Pre-K is about the government making life easier for bad mothers by taking their 4-year olds off their hands for much of the day. Pre-K helps bad mothers have enough time, energy, and money to hit the clubs and make more children. 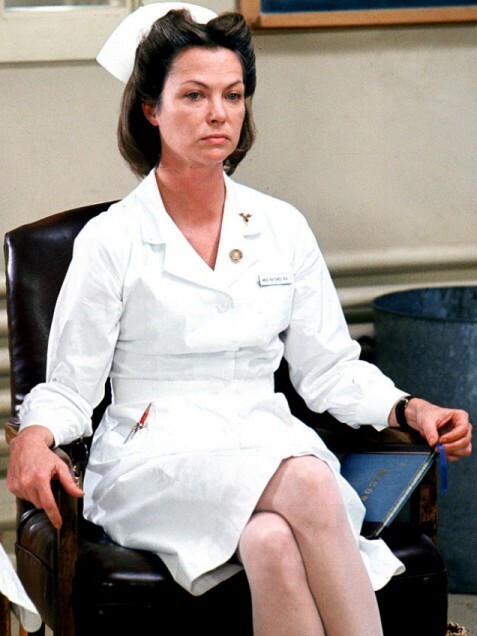 - Nurse visits are about the government making life harder for bad welfare mothers by inspecting them in their homes and browbeating them to do a better job of mothering. Nurse visits should, ideally, teach bad welfare mothers how hard it is to be good mothers (in the eyes of the government), which, if carried out staunchly, might help discourage the bad mothers from having another child quite so soon.